Along with features like a new reading view, Cortana (a personal assistant) integration, better F12 developer tools and annotating capability, the Windows 10 new browser Microsoft Edge also brings in a New Tab page. Those who have used (and hated) the limited tabs feature on Internet Explorer will find the tabs on Edge a seamless experience. Since Cortana is integrated into Edge along with Windows 10, its powerful features are used to personalize the New Tab page according to the user's preferences. The page comes with a search box, which lets you search on Bing by default. You also have the option to Favorite (or bookmark) pages to add to your reading list for quick access. In addition, if you bookmark a website which has a Windows Store app, you can get it quickly and easily from your browser. 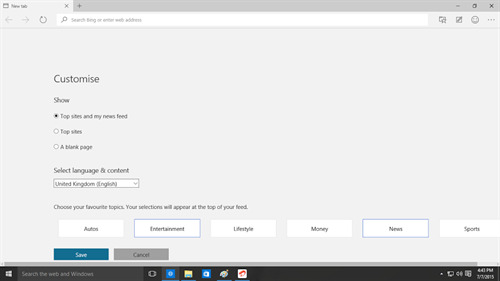 Edge will also recommend sites and apps for you, and let you customize the feeds on the page. 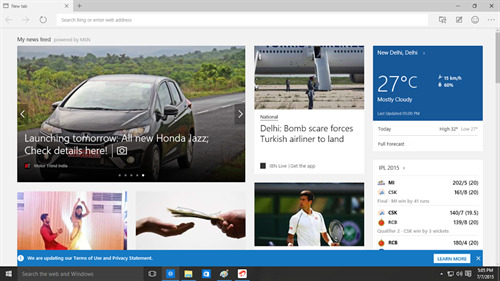 Also Read: Microsoft Edge: A Better Alternative? 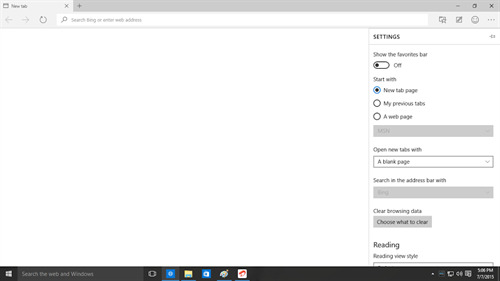 Here is a look at how you can customize your New Tabs page. Each time you open a New Tab, you can either have the browser show you a blank page, top sites, or top sites along with suggested content. As an alternative, you can also choose to have the browser start with a particular web page or your previous tabs. To customize what the page shows, go to the More Actions menu (the ellipse icon) at the top right corner of your browser. Hitting it will open up a menu, from where you can select the Settings option. If you check the last option, you can choose between MSN, Bing or a custom URL to start on. If you want to start with a New Tab page, check New Tab Page in the step above, then scroll down the Settings menu to the "Open New Tabs With" option. 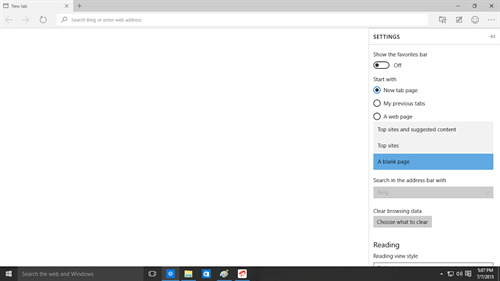 If you choose either of the first two options (and Cortana is supported in your location), Cortana will kick in when you open your browser. Your New Tab page will then have a search bar, suggested content and top sites. You can further customize the content of your feeds that also shows up on the page by selecting the Customize option that you will see on the page the next time you open your browser. Under the Customize menu, you will be able to select the region for language and content that you want displayed and choose your favorite topics to display in your news feed. Save your customization and you're done. 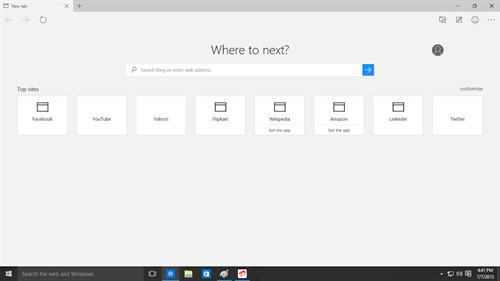 You can now relaunch your browser and enjoy your personalized Edge browser. I like Firefox using FVD speed dial and that does not seem to be an option, all I get is sports crap and media wanna be photos, seems like a facebook browser which would never appeal anyway! This "customization" of the Edge browser is very limited. You only get two looks, "dark" and "light". It is visually boring and basic. For a browser that I am supposed to using for numerous hours a day, this is the worst browser that I have ever used. There are so many things that could be changed to help you enjoy your internet experience. Simple things, like; have a setting to let you chose which new tap page appears when opened, instead of the boring three generic choice given. Have different choices of colour/appearance. Have an option to remove "set aside tab" and "show tab previews". Have a setting to let you automatically open files you download instead of asking each time. There is an option to unclick "ask what to do with downloaded files", but it does let you auto open.